Wide sandy old shoreline, part of Devil's Lake Dune and swale complex. When the glacier receded from the landscape, the post glacial great lakes were both much higher and lower than the lake levels we have grown accustomed to in recent times. As the post glacial great lakes rose and fell, sand, loam, clay, muck and marl materials were sorted and deposited along the coastal regions. Shorelines of the post glacial great lakes can be found within the coastal lake plain. Some of the best examples of old lake shorelines can be found in the Alpena area. 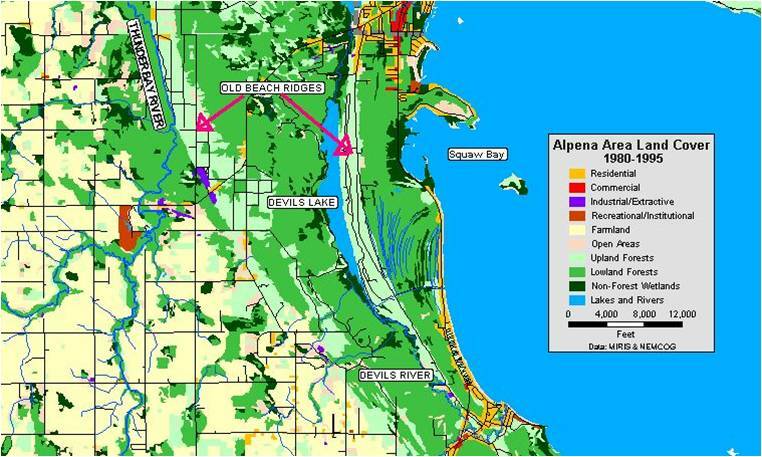 A wide sandy ridge, one to two miles inland from the Lake Huron Shoreline, runs from the community of Black River in Alcona County, through Negwagon State Park and Ossineke continuing north into Alpena Township and City of Alpena. Sandhill Road in Alcona County and Piper Road in Alpena County follow this dry sandy ridge. Acting as a dam, the ridge created the eastern shoreline of Devil's Lake. Cedar Lake and Sunset Lake were created in the same manner.